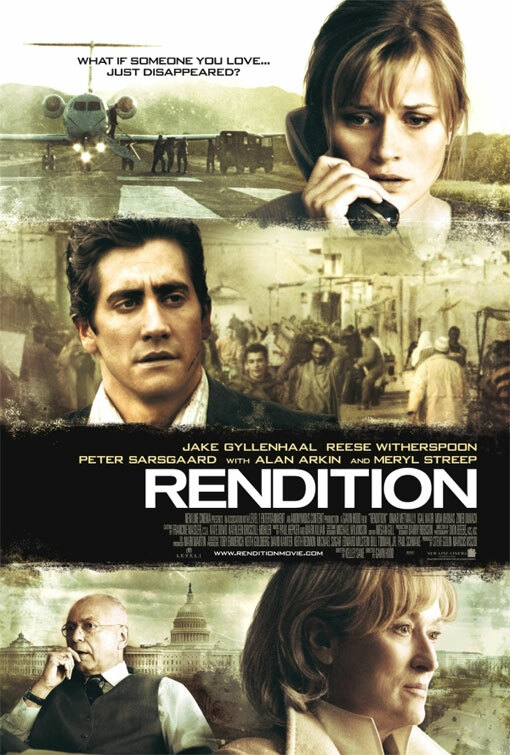 In what amounts to yet another “message” film that borders on political propaganda, Rendition is still able to produce solid acting and a gripping story. Even though this is clearly not a bipartisan film, it walks that thin line without teetering over completely to the realm of Fahrenheit 9/11. Since it is getting more and more aggravating watching yet another film portraying the “Ugly America” so here’s to hoping that come November 2008, that pattern changes. It would have been an even more productive “statement” had the film not taken a side when telling the story. As you will see when watching, there are many twists and turns the writers could have taken advantage of to make a more interesting story and ending. Instead they made the decision early on to once again expose Washington as the evil enemy of Constitutional rights. Meanwhile, a pure “artistic” look into this practice could have created something special. Instead, all we got was a little better than ordinary. Jake Gyllenhaal plays Douglas Freeman, an overseas CIA operative who happens to possess the rarest trait in his field: a conscience. After a short stint as a young analyst, whose duties included little more than providing intelligence to the big wigs, he is thrust into a position on the ground after a terrorist bombing unintentionally kills one of the agency’s own. During this same timeframe, Reese Witherspoon is awaiting the return of her husband, Anwar El-Ibrahimi, from a business trip to his homeland of Egypt. El-Ibrahimi is played brilliantly by Omar Metwally, who transforms from a loving father and husband to a guy fighting for his life against the government who had protected him for so long. He is abducted by that very government on his return flight because they have some minimal evidence he may have been connected to the bombing that killed the operative visiting Gyllenhaal. Witherspoon manages to step out from her Legally Blond persona to play a wife on the verge of losing it when she cannot get any answers for why her husband has just disappeared. The closer she gets to any answers, the more she finds out that no one wants to give them. The story interweaves a few other characters that play integral roles in the plot, and lend a lot in terms of rounding out the story. In what could have been the saving grace, the writers and director decided not to harp on specific details (ie. where this was all occurring, actual positions and titles of some characters, etc.) in order to produce the most complete story. We follow the interrogation and torture of El-Ibrahimi for information he may or may not possess. In the background is Gyllenhaal weighing the sides of a right to defense versus saving lives if El-Ibrahimi does in fact know anything. Meryl Streep shines as the cold-hearted CIA director who cares only about the good of the country with little regard for its citizens and their rights. The combination of solid acting and an intriguing story produce a decent film. As I mentioned, there are unfortunately no surprises. If they took a few more liberties and steered away from the inherent political message that comes across, Rendition could have been one of the better films of the year. Let’s hope directors start taking note that they are not journalists; their job is to entertain us. Let the “spin” to the network news and keep it off the big screen. Interesting Cameo Appearance: Academy Award Winner Alan Arkin (hilarious foul-mouthed grandpa in Little Miss Sunshine) as Senator Hawkins. Douglas Freeman: This is my first torture. Corrine Whitman: Why don’t you ask your boss how badly he really does want to stick his neck out for a terrorist. Douglas Freeman: In all the years you’ve been doing this, how often can you say that we’ve produced truly legitimate intelligence? Once? Twice? Ten times? Give me a statistic; give me a number. Give me a pie chart, I love pie charts. Anything, anything that outweighs the fact that if you torture one person you create ten, a hundred, a thousand new enemies. Corrine Whitman: Honey, this is nasty business. There are upwards of 7,000 people in central London alive tonight, because of information that we elicited just this way. So maybe you can put your head on your pillow and feel proud for saving one man while 7,000 perish, but I got grandkids in London, so I’m glad I’m doing this job… and you’re not.